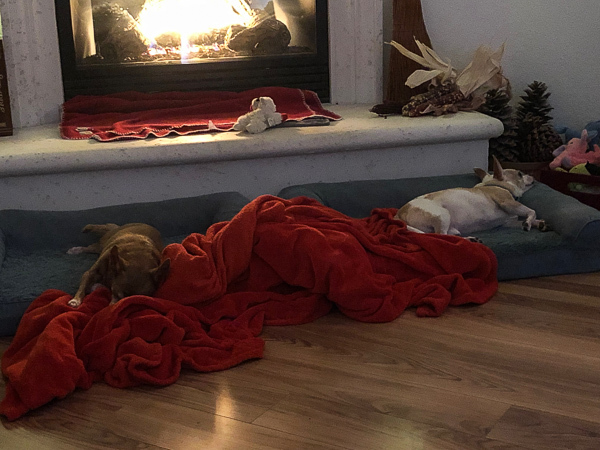 The dogs are having a rough week here relaxing in front of the fireplace. 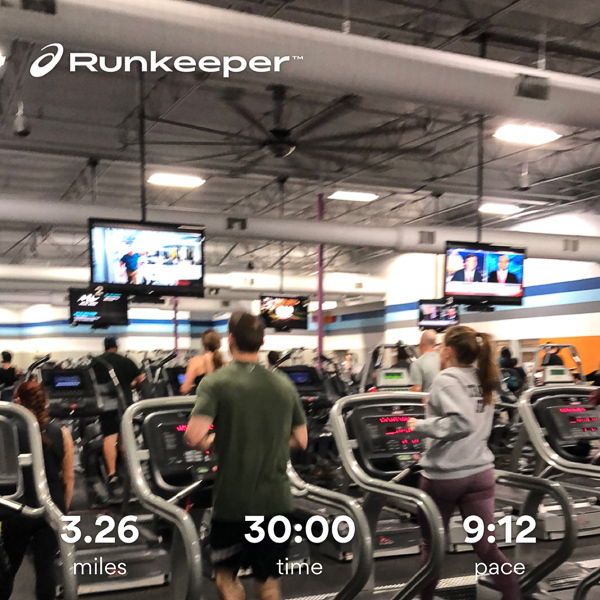 And I’m still trying to up my running pace with treadmill interval workouts, but that’s been tricky this month. Stress, anxiety, and the winter weather have me just hanging in there with my gym routine currently. But I need to get serious soon if I’m thinking about longer races this year and get creative with my longer runs trying new routes and trails. Monday was a relaxing day, we tackled projects at home then stepped out for lunch at Vegan Plate to try another new dish. This coconut curry noodle soup was called Malaysian Laksa and it was filling and delicious. After we ventured to Trader Joe’s because it was near by and I haven’t been in months, maybe even over a year, since we have a Sprouts so close to our house now. 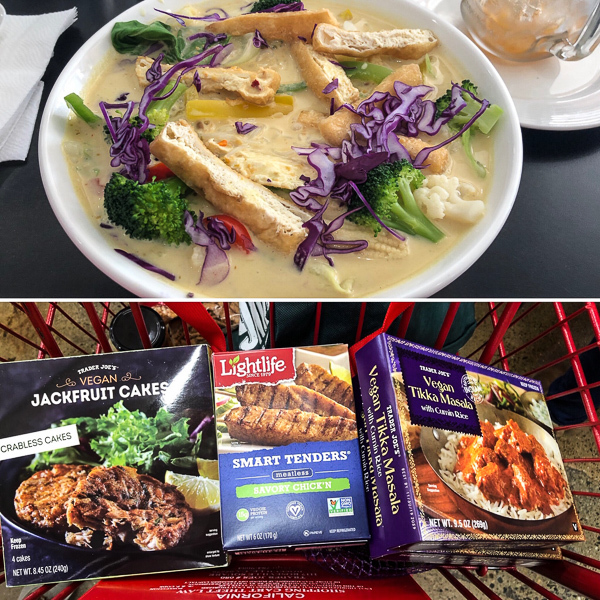 We loaded up on new vegan goodies to try, but I was also reminded why I stopped going – the crowds were insane! The store was so packed we couldn’t get through the isles and the checkout lines were backed up into them. I love Trader Joe’s, but the closest location is usually intolerably crowded lately. 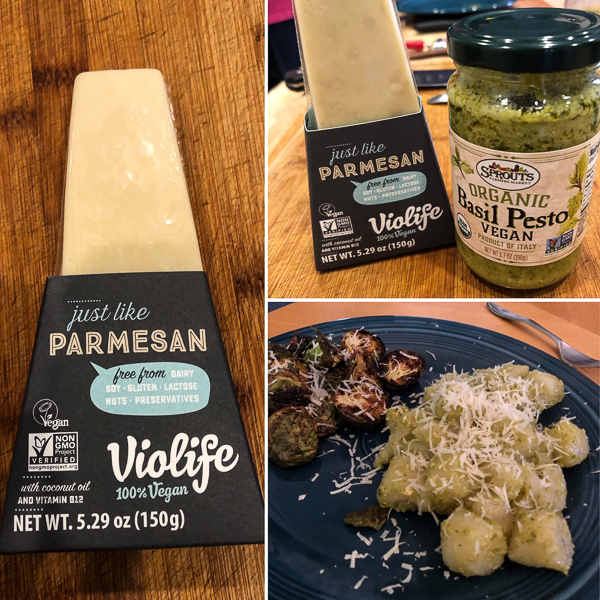 We did find the cauliflower gnocchi in the frozen foods section and headed to Whole Foods next for more new finds where I grabbed Violife Just Like Parmesan Wedge. That plus the gnocchi and Organic Vegan Basil Pesto from Sprouts inspired a delicious dinner. The Violife Parmesan is delicious, it shreds and tastes much like the dairy stuff. And it’s gluten free and nut free making it a winner for our next family gathering. 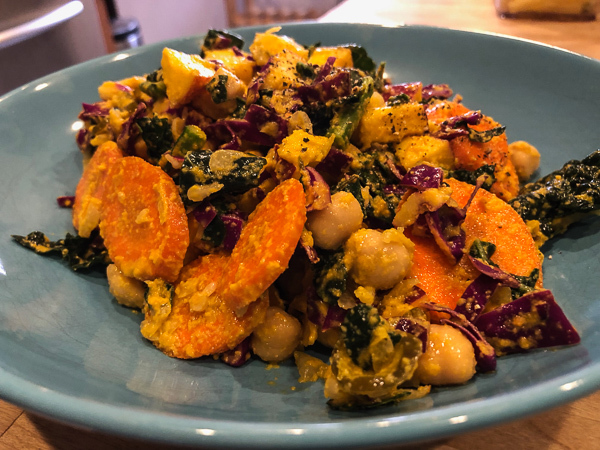 So that was more of a splurge meal and a salad with this dressing is not, but it is delicious loaded with whole, plant based ingredients while being lighter. You know I’m obsessed with raw ginger and raw garlic and always looking for new ways to enjoy them. This dressing works for that! It’s thick, very thick, which makes it awesome for coating a kale salad. And it has a warming color to brighten up winter blues. It’s tangy with a bright ginger flavor and fun kick from garlic. 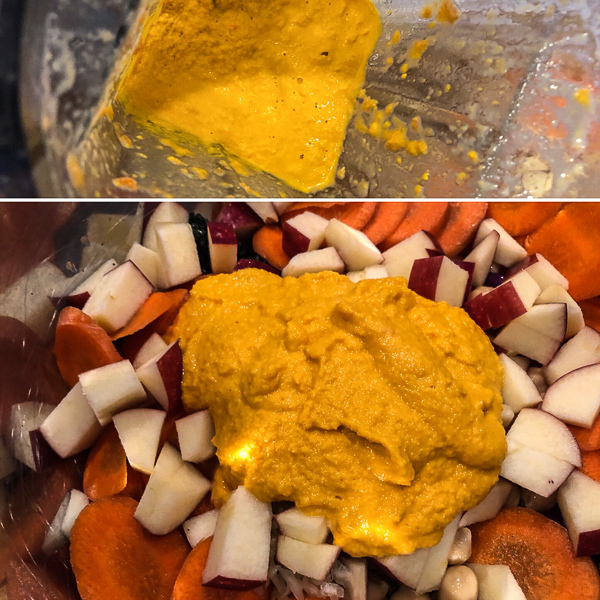 A little bit of tahini goes a long way blended with sweet carrot complimenting the flavors nicely. 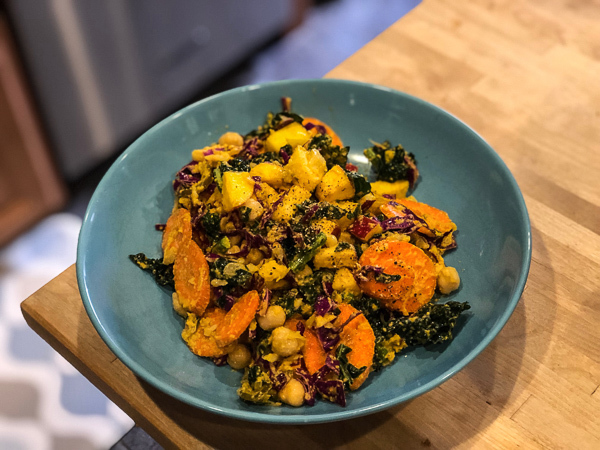 Brighten a winter meal with this hearty salad dressing while keeping your health goals. I’m in the same boat in regards to upping my running game. It’s -5 degrees this morning and I’m going to have to run on the treadmill again, which I hate. I’m signed up for a 1/2 marathon in June, so it’s time to get serious. We;re in love with Violife cheese. It’s SO realistic and delicious! Yes, I was thinking about a half in March, but can’t seem to motivate myself for the training and will probably wait until later spring. Violife is amazing, can’t wait to try more of their products! I’m so excited that VioLife is popping up in more places! Oddly, tho, when I see them, I see a different kind of vegan cheese, and usually can’t find the one I tried previously! In a way that is good because I can try new things but then I can’t find the ones I really liked prior! Me too, looking forward to trying their other products. And so fun making trips to Trader Joe’s and Whole Foods just to find new things … when they’re not insanely crowded, lol.